Despite various expensive websites strongly promoting their "social" aspects, the fact remains that internet forums are a fairly antisocial experience. You sign in with an alternate identity, type some words into a box, and hope that other people might do the same in response. We visited alonelylife.com, where forum users kvetch about their problems meeting people, chime enthusiastically about how much better their e-friends are, and trade terrible poetry, despite having never learned how a haiku actually works. 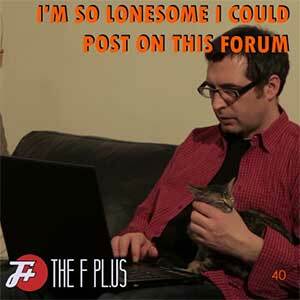 This week on The F Plus, seven will be the loneliest number you could ever do.